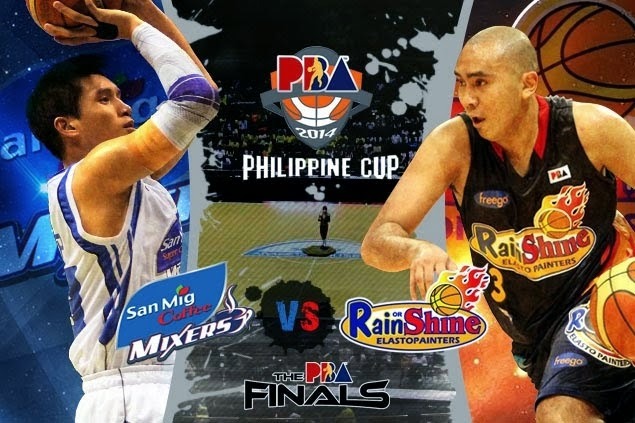 Game 4 Live: Rain or Shine vs. San Mig Coffee Updates, Scores - PBA PH Cup Finals 2014 - Balita Boss! The PBA Finals Game 4 of Philippine Cup between Rain or Shine Elasto Painters vs. San Mig Super Coffee Mixers will tipoff tonight 8:00 p.m. Friday, February 21 at Smart-Araneta Coliseum, live on TV5. San Mig leads the series two games to one. Lee misses game-tying three. Mixers wins. Norwood fouls Barroca. Mark hits two FTs. Lee scores quick two. Timeout San Mig. Painters calls final timeout. They had some difficulties inbounding. Sangalang was foul. First throw missed. He makes the second FT.
Jumpball between Norwood and Sangalang. Painters win the ball but Quinahan misses the layup but there's a foul. Sangalang scores to push the lead to six points. Painters still trails by two. Lee's jumper cuts the lead to 4. Devance again. He hits a floater. Two free throws goes in for Devance. Chan misses a three pointer. Belga scores putback. Devance throws an air ball. Mixers takes the lead with reverse layup of Mallari. Devance (6pts) tied the game. Barroca converts three point play. Barroca hits three. Mixers down by 3. Lee closes the period with jumper. 21 points for Lee. Sangalang hits again. Norwood answers with a jumper. Lee scores plus a foul. He completes and-one. Lee knockouts a three. Its a 1 point game. Chan 1/2 FTs. Norwood drains triple. Painters cut it to 4 and we’ve got timeout. PJ Simon hits two FTs. Norwood makes his two points. Devance answers. JR Quinahan hits a three pointer for the first Painters points of the second half. Same score. 24 second violation by the Mixers. "@SolarSportsDesk: Halftime: San Mig 52-42 Rain or Shine #PBAFinals pic.twitter.com/ap7Gj6ibES"
Beau Belga converts two free throws. Sangalang scores inside plus a foul but misses bonus FT. Almost an alleyoop but Chris Tiu clips Justin Melton off a lob by Mallari. Melton makes two FT. Painters TO, Mixers got out in transition and Mark Barroca found Melton. Cruz finishes with a layup. Jervy Cruz hits the jumper. Reavis goes 2/2. Quinahan hits triple. Yap 1-of-2 from FT.
James Yap hits another triple. Painters win the opening tip. June Mar Fajardo of San Miguel @TheSMBeermen is d Philippine Cup's Best Player of the Conference.